Mrs. Wiley was a well-known community activist from Cumberland, Virginia. She founded the Central Virginia Community Health Center in 1970. The Central Virginia Community Health Center now has 15 locations across Virginia and provides care to over 48,000 people per year. ​I sculpted the bust from old/faded photographs and accounts from her family members. The portrait bust is on permeant display at the newly remodeled and growing Health Center in New Canton Va. I feel privileged to have created a bust to honor such an individual so highly valued by the healthcare community in central Virginia. 21" (tall) x 23" x 12" | Completed in 2012. 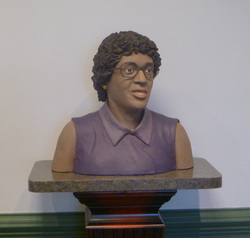 The bust is made from porcelain, her glasses are made of bronze. This sculpture was part of the “Tom Tom Founders Festival of Music, Arts, & Innovation” in Charlottesville, Virginia. Over 1,000 children and adults were invited to press their fingers into the bear when it was wet clay. Their combined finger imprints created a texture for the bear’s fur. 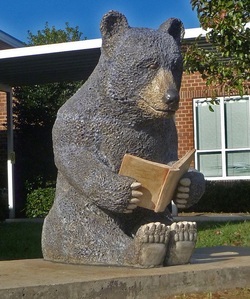 This sculpture is now on permeant display in front of Baker-Butler Elementary School in Charlottesville, VA. This piece is colored with underglazes. This sculpture is on permeant display in the Echoes of Nature Sculpture Park at Baker-Butler Elementary School. It serves a place of meditation and conversation. It was designed by Su Park, and I got commissioned to build the piece.